How Many People Does It Take to Change a Fluorescent Light? HomeGamma ChatHow Many People Does It Take to Change a Fluorescent Light? The past few months Leo, Gamma Solutions’s National Service Manager, researched LED lights in view of replacing our existing fluorescent lights with LED lights. The main advantages of using LED lights include significant reduction of power usage for lighting, instant tube startup, shock proof, superior tube life expectancy (which also means saving costly labour and outlay of lamp replacements), superior color rendering, and CO2 (greenhouse emissions) savings. We tried 3 different brands of LED light tubes over a period of 3 months, our testing included taking light readings and installing LEDs in pilot offices and trying them out for months. The LED tubes being much brighter than the fluorescent tubes, it turned out that we needed 4 LED tubes to replace 6 fluorescent tubes. The LED tubes are 18W each compared to 36W for each fluorescent tube. Since we need 2/3 the quantity of tubes and since each tube uses half the energy used by fluorescent tubes, the total cost of lighting the office will be one third (33.3%) the existing cost. This translates into a total saving on our lighting costs of 66.6%. As a result of our testing, we decided to go ahead with the swap. The manufacturers’ instructions on how to install LED tubes are identical and very straight forward. Since our ballasts are magnetic, all we had to do is remove the fluorescent tubes and their starters, and install the LED tubes and their starters instead. We purchased about 170 LED tubes to replace the 244 fluorescent tubes installed in our head office, and we organised for our electrician Phil Leydon to install them for us. It took Phil one and a half days to replace all fluorescent tubes with the LED tubes. He also replaced our existing spot lights with LED lights. Just before he got to head off to his next job, one of the light circuit breakers in the upstairs office tripped. It didn’t make any sense, we had just finished replacing all fluorescent lights with the LED lights, and this should have dropped our power usage to one third its original value. So why was the safety switch tripping. It was a very long afternoon for Phil who was trying to figure out what was happening. He finally figured it out, and it was a beauty! Phil took out the light switches and found that they were hot. He then measured the current going through each switch and it was a staggering reading. Our power consumption had more than doubled. How can that be? We are using two thirds the number of lights. Each light we have installed should be using half the energy of the original lights. So how could this wattage increase be explained? We contacted two of our LED suppliers asking them for advice. They were both baffled, and couldn’t provide us with an explanation. It was then down to us to figure it out. Half of the office lights were off all afternoon. Two of us were sitting in reception with Phil who was at that stage perched on top of a ladder. We were watching him test. We handed him tubes or held his flashlight and tried to help him brainstorm. The other employees were throwing jokes amongst each other as to “how many people does it take to change a light bulb?” or how “romantic” the office looks with half its lights off. Phil removed the cover protecting the wiring in one of the light fittings, attached one LED tube and its starter, and measured the current around the live wire exiting the light fitting. It was a staggering 0.56 amps, over 10 times more than the expected amperage! He repeated the same with one LED tube from each different supplier. They all gave the same result. He cancelled the jobs he had for the rest of the day, as it was obvious by then that this was going to take a while to resolve since the manufacturers themselves don’t know what was causing it. He then removed the LED tube and its starter from the light fitting he was using for testing and attached a fluorescent tube and its starter and measured the amperage exiting the fitting. It was 0.22 amps. No wonder the safety switch is tripping! I don’t know what made him think about the capacitor, but he disconnected one, attached a LED tube and its starter and measured the amperage exiting the light fitting live cable. It read 0.04 amps. OK, that’s better. With the capacitor in, when a LED tube is attached, the amperage going through the live wire is 0.56, when the fluorescent tube is attached, the amperage is 0.22, when both are attached the amperage is 0.26. In all cases, the amperage going through the capacitor wires is 0.56. Once Phil identified that the capacitor is the problem, we had a temporary solution to allow us to switch all the lights in the office while waiting to permanently fix the problem. In order to drop the amperage going through each light switch to a safe amperage, Phil added a fluorescent tube to a number of light fittings containing one LED tube. We now had to make a decision on whether to remove all capacitors and label all light fittings as “LED light only” fittings, or to put back the old fluorescent tubes. We decided to convert the light fittings into LED ONLY fittings and label them accordingly. This is going to take Phil about 25 hours to convert all 122 light fittings. Since 2007 all fluorescent light fittings have capacitors. Light fittings installed before 2007 may or may not contain capacitors. How many people have followed the LED light manufacturer’s instructions and replaced their fluorescent tubes with LED tubes and assumed that they are saving energy, and how many are in fact using more energy instead? 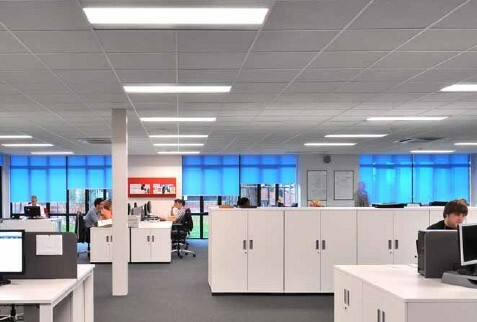 In short, if you replace your fluorescent tubes and starters with LED tubes and starters on light fittings compliant with AS/NZS 60598.1 without disconnecting the capacitor, you will be increasing your energy bill instead of reducing it.